Aaron's Partners With 'The Wendy Williams Show' To Deliver Home Transformation To West Virginia Family | Aaron's, Inc.
ATLANTA, Feb. 9, 2017 /PRNewswire/ -- Aaron's, Inc. (NYSE: AAN), a leader in the sales and lease ownership and specialty retailing of furniture, consumer electronics, home appliances and accessories, delivered and installed a complete home makeover for the Dobbs family of Granville, West Virginia, who was recently surprised as the grand prize winner of the "Big Blue Bow Home Makeover" on "The Wendy Williams Show." The home makeover is part of Aaron's continued partnership with "The Wendy Williams Show" and Aaron's holiday promotion, the "Big Blue Bow Event," with shopping deals and big-prize giveaways, including nearly 1,435 giant stockings stuffed with toys and games, cash prizes of up to $5,000, and a 2017 Kia Forte EX delivered to a lucky customer's home. 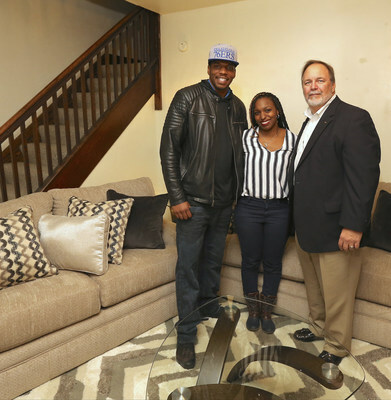 The Dobbs family, including Anthony, Jasmine and their son Zaylen, were surprised on the December 9th episode of "The Wendy Williams Show" with new furniture, appliances and electronics from Aaron's. The home makeover was displayed on the show's stage wrapped in a big blue bow as a nod to the "Big Blue Bow Event." The Dobbs recently moved into their first home but have struggled to pay bills and student loans and could not afford a washer and dryer or to replace a worn-out living room set. Before moving into their new home, the Dobbs were living in a smaller townhouse. The couple works fulltime, Anthony as an assistant director for the local parks and recreation department and Jasmine as a paralegal who also is studying for her master's degree in project management. "It's heartwarming to see a deserving family receive a really special home makeover and Aaron's is grateful to be able to make this happen in partnership with Wendy Williams," said John Robinson, President and Chief Executive Officer of Aaron's, Inc. "The Dobbs family now has a newly refreshed home for their family and will enjoy coming home every day to a modern and completely furnished household." During "The Wendy Williams Show" surprise presentation in December, the studio audience got another big surprise, with each of them receiving a free Woodhaven mattress from Aaron's. For more than three decades, Woodhaven has set the standard for superior quality and affordability with their handcrafted, American-made furniture. About "The Wendy Williams Show"
"The Wendy Williams Show" is the provocative, must-see talk show in daytime. Taped live in New York City, the show screens internationally in 52 countries, is syndicated nationally and airs on BET at midnight. Viewers delight over Williams' distinctive and entertaining personality, as well as a diverse mix of interviews with celebrity guests from television, film, music and sports. Popular segments include "Hot Topics," in which she delivers her own unpredictable, honest and authentic take on the juiciest headlines, and "Ask Wendy," during which she offers real advice to audience members looking for solutions to problems. "The Wendy Williams Show" is produced and distributed by Debmar-Mercury.